KATIE: Ok, Glogirly. It's time for breakfast already. 8AM and you're still in bed. Did you forget to turn your alarm clock forward last night? This Daylight Savings stuff is going to starve us to death. WAFFLES: Boss! We have a daylight savings account? Like at the bank? With an ATM card and everything? KATIE: Waffles, there's no savings account, no ATM card. Daylight savings means we LOST an hour yesterday. WAFFLES: Did we bounce a check? Is that why we lost an hour? Are we in trouble with the daylight savings bank? KATIE: Waffles, there is no bank. WAFFLES: Oh my COD! Did someone rob it? What about all our daylight savings? WAFFLES: But where does everybody keep all their daylight savings? What, are we supposed to keep it under our mattress??? KATIE: Waffles, daylight savings is when we turn the clocks forward by one hour every spring. WAFFLES: Boss, it's not spring. There's still snow and stuff. This sounds fishy. KATIE: Whatever. Every year on the second sunday in March we turn the clocks forward by one hour. That's what we did yesterday. 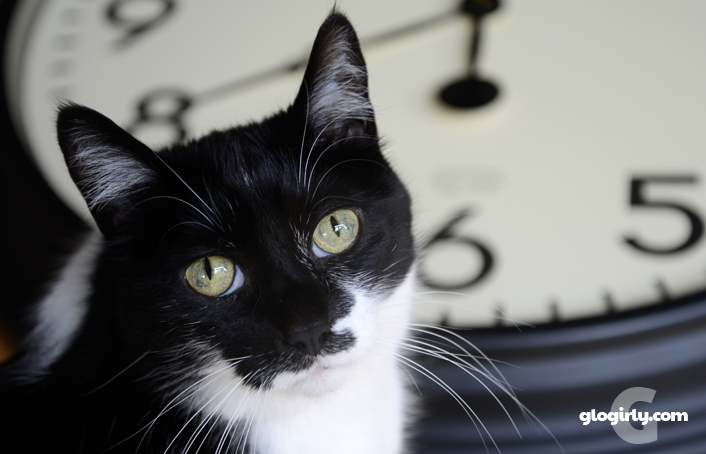 WAFFLES: But if we changed all the clocks, how will we know what time it is? How will we know when it's time for dinner??? It are always time for dinner! um...using that set of purrameters, it's ALWAYS dinner time, 24/7! wait a minute...you turned yours BACK? Ours went an hour ahead...now I am as confused as poor Waffles! I wish there was a bank.. I'd like to make a big withdrawal..
Waffles, our "inner" clock tells us when it's time for dinner! It's always time for food here!!! 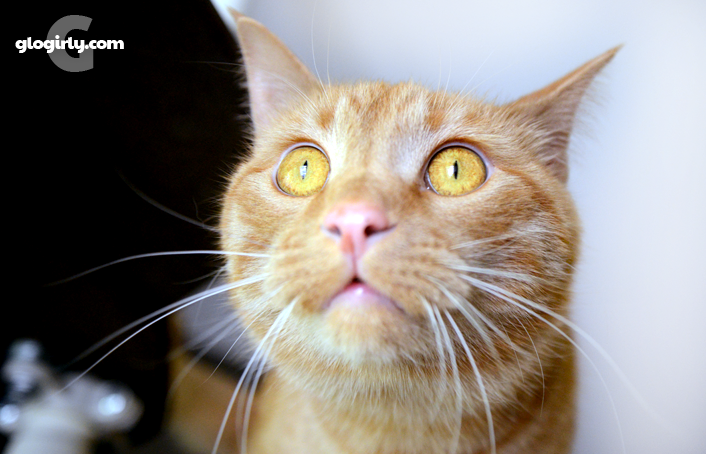 Binga got so confused by switching the clocks back and forth that she just asks for dinner all the time! We ALWAYS know when it's time for dinner. That's never a problem. To be safe, you can ask every time someone goes into the kitchen. I let my mum worry about all the silly hour changes. If I am hungry, I yell, she feeds me. Simples! I had to wake Ruby up yesterday morning. 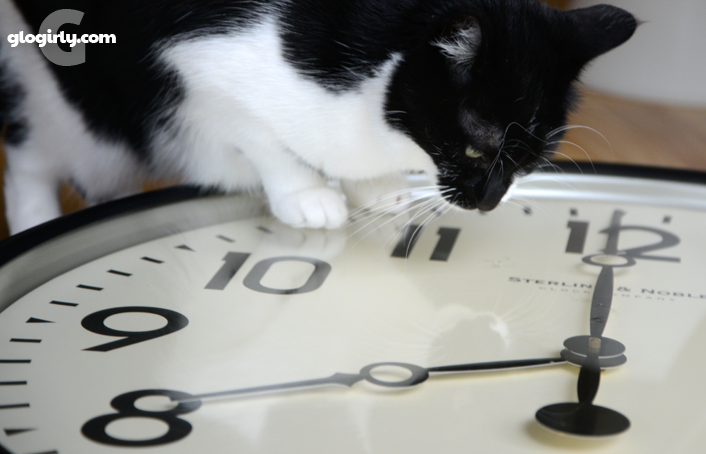 Cats have the right idea: why on earth do humans need to mess with time? Truffles and I actually slept in yesterday morning regardless of what the clock said! UGH! Thats all I have to say about Daylight savings time! I wish the goofy ones would quit messing with the clocks! Waffles, this is Valentina. I for one am not fooled by Daylight Savings. I woke Z-Girl up at the same 4:45AM timeframe as always on Sunday. She wanted to know who adjusted my internal clock. I guess this is why she refers to me as the Alarm Cat. Daylight savings bank? Waffles, you are one smart kitty! No matter what the time it's always snacking time, right WAffles??? I think you will know too. LOL. There's a lot of stuff we might miss but dinner is never one of those things!! We want a deposit box at the Daylight Savings Bank where we can save up some time to extend a vacation day. Your inner hungries will let you know, Waffles. They're *always* on time. Mum says she hides the hour inside the clock. Katie, does he allways get dense when he’s hungry? I’ll bet he’s hungry a lot. MOL! We had to wake Mommy up this morning! She slept too late! How can such a young boy have so many cobwebs in the head..mol.. There's no such time lost here for din din for the kitties. It's din di every hour! Don't worry Waffles kitty cats use all the time they can get for whatever they want. We are your servants! Breakfast, lunch, dinner, snacks. Anytime is devoted to kitty cats!